WHERE IS VICE SENIOR GENERAL MAUNG AYE? 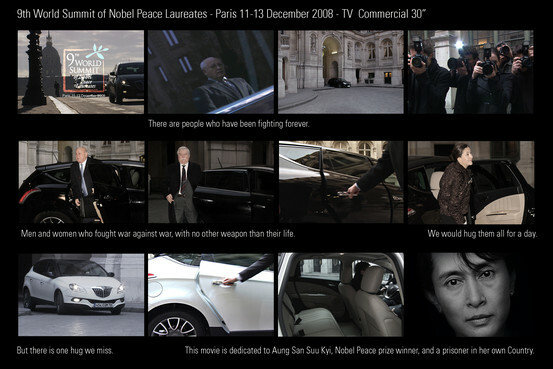 In an innovative new TV film breaking today, the Chrysler brand has joined with Lancia Automobiles and the international community in the movement to call for the release of Aung San Suu Kyi, Burmas pro-democracy leader and 1991 Nobel Peace Prize Laureate, who has been in and out of house arrest since 1989. “There is a plan to release her soon … so she can organise her party,” Min Lwin, a director-general in the foreign ministry, in Manila for a meeting of the Association of Southeast Asian Nations (Asean) and the US, told the Associated Press. 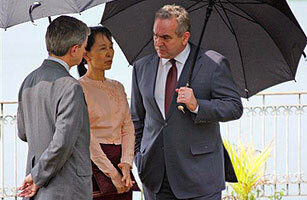 Aung San Suu Kyi (C) arrives for a meeting with U.S. Assistant Secretary of State for East Asian and Pacific Affairs Kurt Campbell (L) at the Inya Lake Hotel in Yangon November 4, 2009. A delegation of senior U.S. officials, pursuing a new dialogue, met with Myanmar’s military rulers on Tuesday in the highest-level talks with the reclusive junta in 14 years. The move by President Barack Obama’s administration to engage the junta appeared focused on pushing for free and fair elections next year, although analysts said the rapprochement was as much about geopolitics and the growing regional influence of China. I know that throughout history the Nobel Peace Prize has not just been used to honor specific achievements, it has also been used to give momentum to a set of causes. And that is why I will accept this award as a call to action, a call for all nations to confront the common challenges of the 21st century. 衆議院議員、元首相　羽田　孜　Tsutomu Hata, MP, Former Prime Minister of Japan (Japan) wrote 64 words: ア ウンサンスーチーさんの長期に渡る拘束に、強く反対します。スーチーさんの自由と健康を祈念します。I strongly protest the extended detention of Daw Aung San Suu Kyi. I pray for the freedom and good health of Daw Aung San Suu Kyi. Sec. Madeleine Albright, Drew Barrymore, David Beckham, Sandra Bullock, Daniel Craig wrote 64 words: Nineteen years ago, the Burmese people chose Aung San Suu Kyi as their next leader. 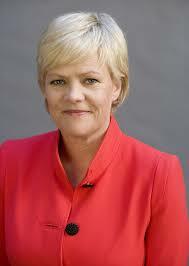 For most of those 19 years she has been kept under house arrest by the military junta that runs the country. We must not stand by as she is silenced again. 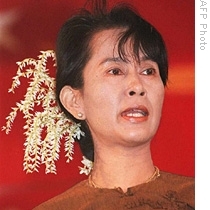 Now is the time for the international community to speak with one voice: Free Aung San Suu Kyi. Bono, U2 wrote 64 words: Packing a suitcase for a place none of us has been/A place that has to be believed to be seen/You could have flown away/A singing bird in an open cage/Who will only fly, fly for freedom/Walk on, walk on/What you’ve got they can’t deny it/Can’t sell it, can’t buy it/Walk on, walk on/Stay safe tonight. Yoko Ono wrote 64 words: Your heart beats with my heart. My eyes see what you see. My belief is your belief. And my life is connected to thousands of universes, as is yours. Every twinkle of the star must travel billions of years to be seen by us. But our minds do not have to travel at all to be seen by each other. Because we are altogether. Women Nobel Peace Laureates, Mairead Maguire (1976), Betty Williams (1976), Rigoberta Menchú Tum (1992), Jody Williams (1997), Shirin Ebadi (2003), and Wangari Maathai (2004) wrote 64 words: We, your sister Nobel Peace Laureates, stand with you and call on the governments of the world to demand your immediate release. Detained against Burma’s own laws, your imprisonment and trial are a stark illustration of the brutality and lawlessness of the Burmese military regime, which holds over 2000 democracy activists in prison. We look forward to a day when you are finally free. 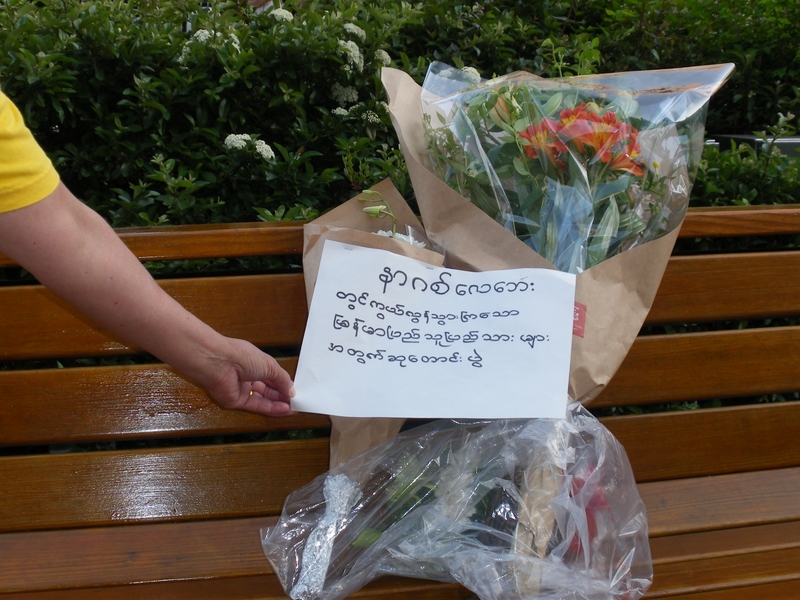 Lwin Aung Soe (Japan) wrote 64 words: Happy Birthday, Daw Suu. We have been long expecting for Burma’s democratization. We wish you to be released immediately, too. Like the difference of black and white, you are sharply contrast to Burmese dictatorial regime who are repressive but you are no doubt a democracy icon. 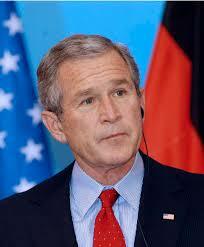 It is great the whole world supports you firmly and never forgets you and our country. Good Luck! Fourth was Burmese junta leader Than Shwe . 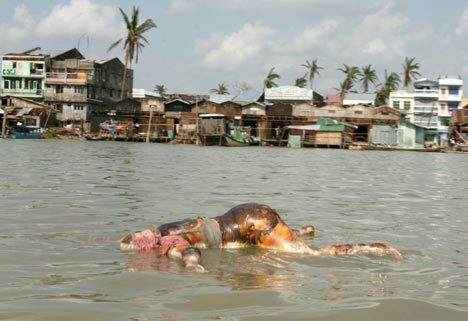 He has been denounced by the international community for delaying access of relief workers to flood-devastated areas in May last year, when 140,000 people were killed or went missing and more than 2 million people were displaced in the aftermath of Cyclone Nargis. He ranked third in 2008. List of the world’s worst dictators in the Washington Post’s weekend magazine Parade, after analyzing their human rights abuses and the intensity of their absolute power based on data from the U.S. State Department, Human Rights Watch, Amnesty International, and Reporters Without Borders. There are 2,131 political prisoners in Myanmar, including 15 members of Parliament, 229 students, 220 monks, 47 members of the movement “88 Generation Students,” and 456 representatives of the NLD. 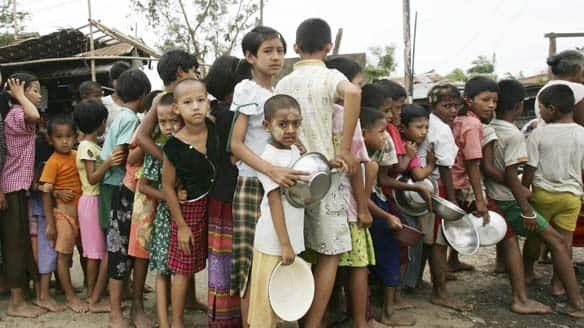 From August 21, 2007 – the beginning of the “saffron revolution” promoted by the Burmese monks – until March 12, 2009, the military has arrested 1,055 protest participants, including 147 monks; another 110 are on trial at the moment, 446 have been sentenced to prison, and there are 19 detained in the labor camps. It may be that the U.S. review can lead to smarter and more targeted sanctions, with better coordination among allies and neighbors. 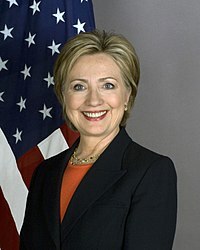 Certainly, we hope that Ms. Clinton will make clear to Burma’s government that the United States could never ease sanctions without first conducting full and free consultations with Aung San Suu Kyi, Burma’s rightful ruler. Aung San Suu Kyi’s party overwhelmingly won an election in 1990, but the junta ignored the results and has kept her isolated and under house arrest for most of the time since. Her release, and that of thousands of other political prisoners — and their families — remains essential. Release more than 2,100 political prisoners and allow them to take part in an election set for 2010. Halt its use of civilians in forced labour. Tomas Ojea Quintana, the UN’s special rapporteur on human rights in Myanmar, called on and urged Myanmar’s ruling generals. Wunna Maung Lwin, Burmese Ambassador to the United Nations. We also express our solidarity with women whose governments have forbidden them from joining us, especially Aung San Suu Kyi, who has been kept under house arrest in Burma for most of the past two decades, but continues to be a beacon of hope and strength to people around the world. Her example has been especially important to other women in Burma who have been imprisoned for their political beliefs, driven into exile, or subjected to sexual violence by the military. We cannot finance companies that support the military dictatorship in Burma through the sale of military materials. These words on the new red banner, which Daw Aung San Suu Kyi put up in her house, can be viewed from the street. “Burmese prisons are predominantly about the exploitation of the vulnerable. 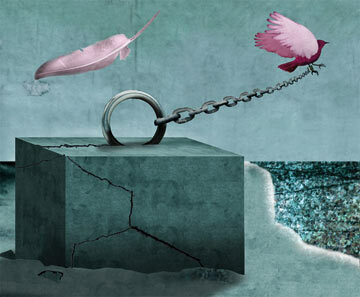 Prisoners become slaves who are robbed of everything. Unless a prisoner is willing to become an exploiter himself, he will suffer without respite. Conditions are worse for political prisoners. If they are not broken by beatings then they will be isolated indefinitely. I’ve seen prisoners whose skin was falling off due to vitamin deficiencies. When I raised this with a visiting doctor he merely laughed. I’ve seen prisoners whose eyes have died, prisoners with blood pouring down their faces, prisoners who have almost forgotten that they are human. Lawyer U Aung Thein, accused by the junta for ‘Contempt of Court” and jailed 4 months. The leaders of the National League for Democracy hail Obama’s victory “with caution,” and reiterate that “only time” will tell whether the new president will be able to “open a breach” in the isolation imposed by the ruling dictatorship in the former Burma. After 18 years in hellish prison, he was finally released together with other 6312 prisoners on 21-2-2009 in amnesty. U Win Tin, Burma’s longest political prisoner, spent over 19 years in the notorious Insein Prison. 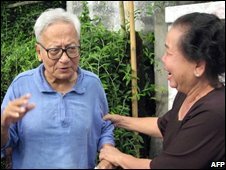 He was unconditionally released today (23-9-2008) with other 9001 prisoners. This time, only few political prisoners were granted amnesty by the Burmese junta. For this extended special news programme, Al Jazeera’s Tony Birtley went undercover in Myanmar to report exclusively on the people’s protests and resulting bloody crackdown by Myanmar’s military government, talking to the protesters, filming the bloody crackdown and gauging the mood of the nation. Real fighters for democracy as well as activists for human rights in Burma are repeatedly and unlawfully arrested, imprisoned, remanded in custody, placed under house arrest, persecuted, sent to labor camps or disrobed if being monks. Under the junta, Burma lacks rule of law. How can the current regime transform its dictatorship into democracy?